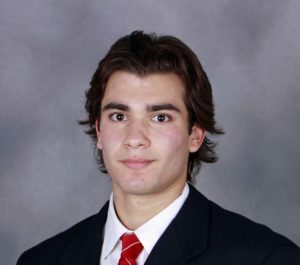 For the second time this season, Wisconsin sophomore Luke Kunin has been named the Big Ten’s second star of the week, after a three-point series split with Michigan over the weekend. Kunin scored two goals in the Badgers 7-4 Friday night victory over the Wolverines. He added an assist in the Badgers 4-1 loss to Michigan on Saturday. The two-goal weekend for Kunin extended his lead for most goals on the team with 11, three in front of teammate Grant Besse. The Badgers are on finals and in their holiday break, but Kunin’s time off will be short. He’s been selected to Team USA’s 27-man preliminary roster for the upcoming World Junior Championship in Toronto and Montreal from Dec. 26-Jan. 5. If Kunin makes the final roster, the United States’ first game will be Dec. 26 against Latvia in Toronto.